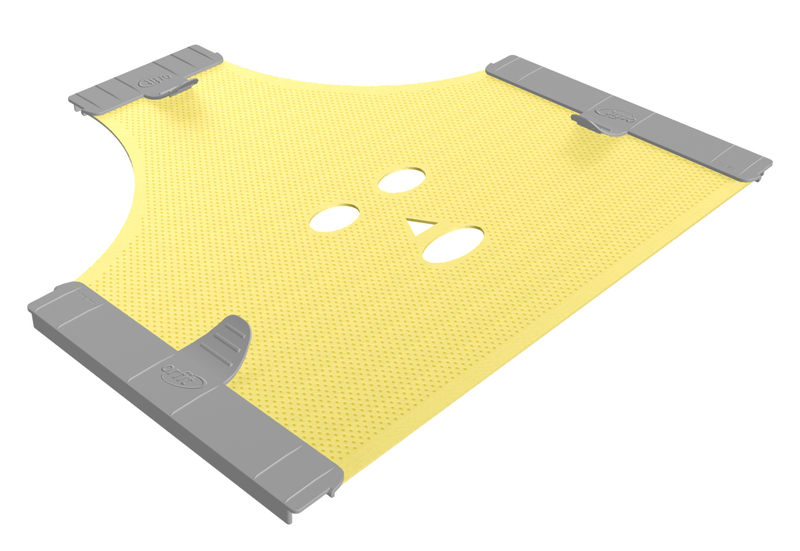 Orfit’s thermoplastic masks are available in a range of perforations and cut-outs. The choice for a perforation type usually depends on the treatment, the patient and the personal preference of the radiation therapist. There are a number of possible applications for each type of perforation or cut-out and in some instances, a certain perforation will be the preferred choice for treatment. However, there are no fixed rules concerning this matter. Orfit’s masks come with a micro and a maxi perforation. 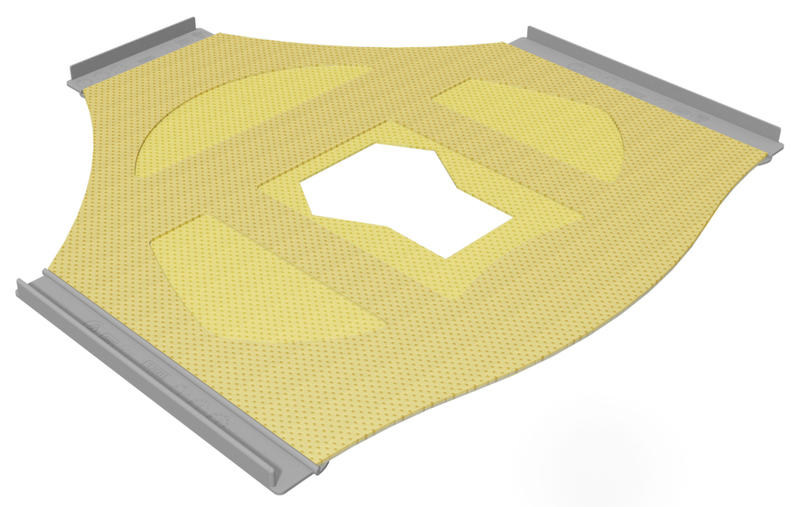 Both perforation types can be used for all sorts of treatment, but there may be some differences regarding the working method. The small perforations make it is easier to draw laser lines on micro perforated masks compared to maxi perforated masks. When using micro perforation you can draw directly on the mask, but with maxi perforation, you need to apply paper tape before making marks. 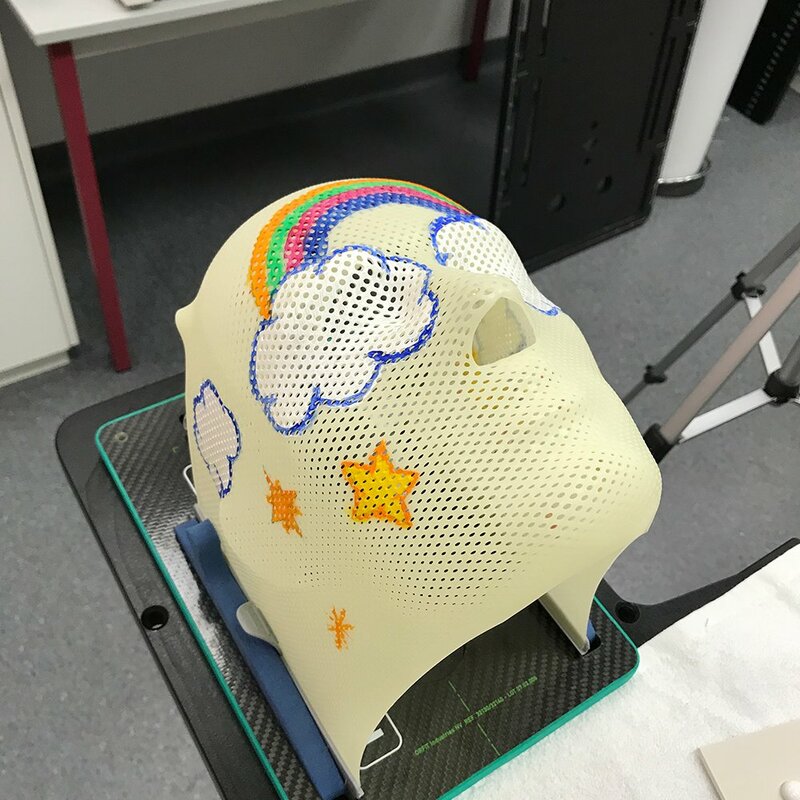 A micro perforated mask is also easier to decorate, which may comfort and help young children and their families through radiation therapy. It can reduce feelings of anxiety, claustrophobia and might even prevent the use of anaesthesia for each fraction. A mask with maxi perforation may feel less restrictive to the patient. When the patient opens their eyes underneath the mask, they will still be able to see a little. The larger perforations are a bit harder to draw on, but it is still possible to create some beautiful mask decorations. The dinosaur drawings on the image below were painted on a maxi perforated mask. Masks with a nose hole cut-out can be used when nasal cannulas are needed. They are very practical for patients who are receiving oxygen. All single layer masks with High Precision and push-pin profiles come standard with a nose hole. This nose hole is a practical reference point when moulding the mask on the patient’s face. When you place the mask onto the face, position the top of the triangle on the tip of the nose, which exposes the nostrils for easy breathing. This video shows you how to expertly mould a nose hole mask on your patient. 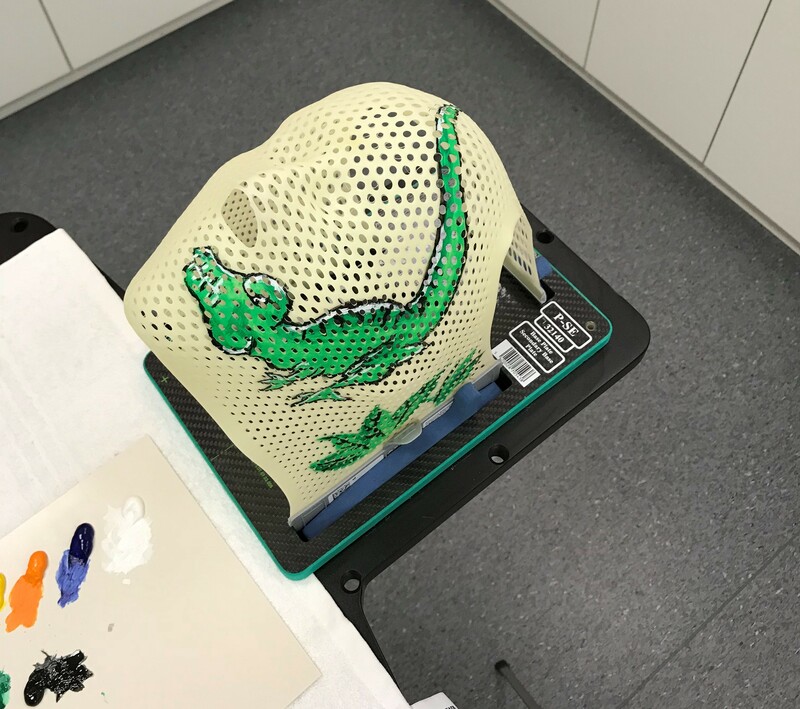 The nose hole cut-out can be enough to make the mask feel less intimidating, as it will allow the patient to breathe comfortably. Nose and mouth hole masks are recommended when the patient has nasal cannulas, for easy access to the mouth and/or throat (for example for intubation), and when a tongue depressor or mouthpiece is required. The nose and mouth cut-outs are ideal for patients under anaesthesia because they allow easy access to the nose and mouth. Of course, they are equally suitable for patients who are not, e.g. when treating nasopharynx and oropharynx cancer. Similar to the nose and mouth cut-out masks discussed above, these can be used for patients under anaesthesia, with nasal cannulas or when a tongue depressor or mouthpiece is needed. Masks with nose, eye and mouth holes are very suitable for claustrophobic patients. They leave the patient’s eyes completely free and allow them to look around, which could make the immobilisation feel less daunting. Additionally, these masks are quite practical when the patient needs lead eye shields during treatment. The open-face mask can be applied in all of the instances discussed above. To create extra stability the mask is designed with 2 layers of thermoplastic material. This mask is ideal for claustrophobic patients because it leaves the face completely free. In addition, the open-face mask can be applied when using a surface tracking system. Do note that the applications of the perforations and cut-outs discussed above are suggestions and should not be seen as fixed rules. 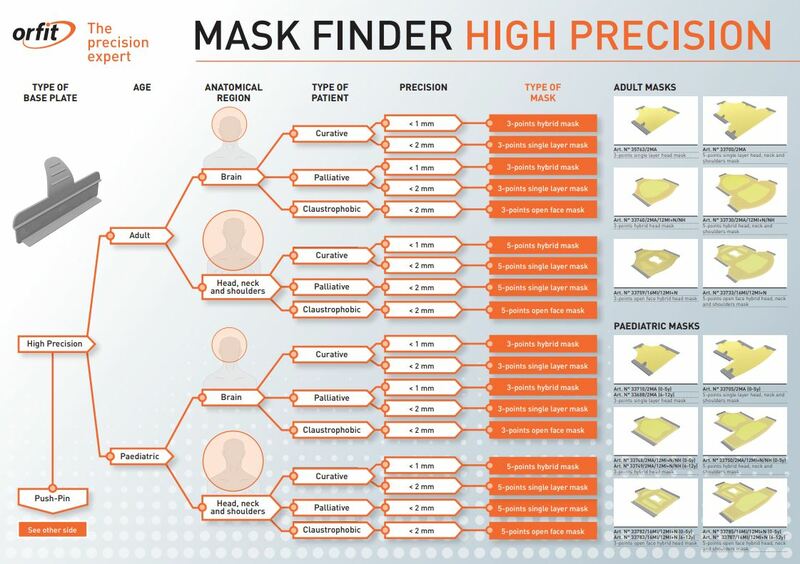 Find the ideal type of mask for your patients with Orfit’s mask finder. The diagram will lead you through various questions and at the end of the decision tree you will find the correct mask model for a specific patient.